I used to live near St. Clair & Bathurst, and more than once had the opportunity to stroll through Wychwood Park, a small private neighborhood just North of Davenport between Bathurst and Christie. Passing the gates into this place is like walking through some portal into a 19th century English hamlet. Unlike those surrounding it, its streets and property lots don’t conform to a grid pattern. The approximately 60 houses line the hilly and winding single street that circles through the area, some of them adorably quaint, some of them astonishingly modern. I don’t have even have the remotest familiarity with architecture or the history of building design, but the feeling of those few blocks brought up images of the English countryside, reading the Romantics by the fire, and reflective walks through green, idyllic landscapes; and it turns out that’s exactly what it’s supposed to feel like. In 1874, a Toronto artist named Marmaduke Matthews (Who is the recipient of the Hogtown Crier Award for the best name in Toronto’s history) built a house on his newly purchased land north of Davenport Road. 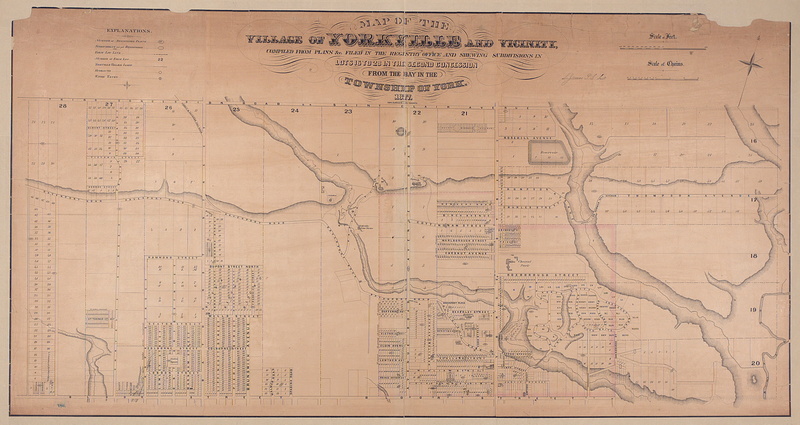 At the time, it was not technically part of Toronto proper, but did form a small part of Yorkville, a township that bordered the city which was slowly annexed into Toronto. 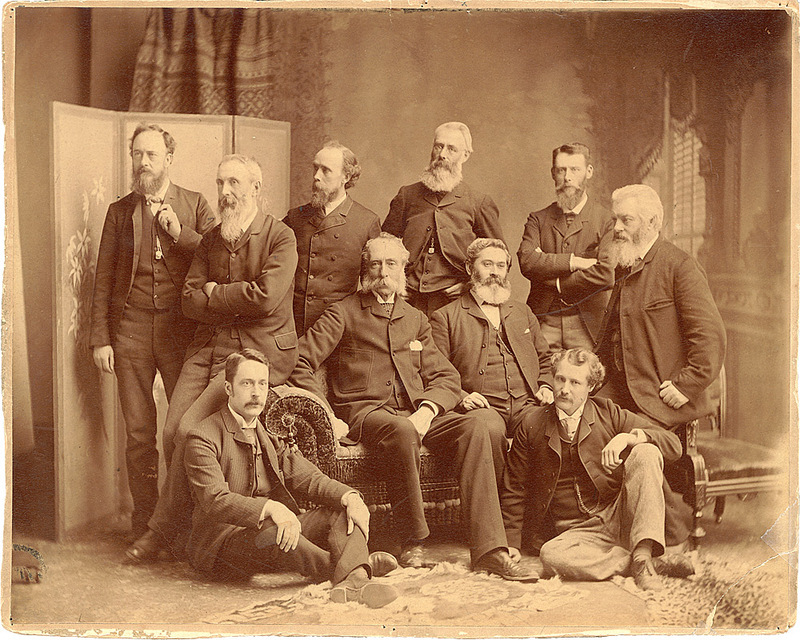 This is a picture of a few founding members of the Ontario Art’s society. Our main man Marmaduke Matthews is the second from the left. This map is from 1877. Matthews’ property was the vertically-running #6 on lot 26 on this map and was comprised largely of forest on all sides. Matthews named the house he built “Wychwood” after Wychwood Forest, a park with its own amazing history that was near his childhood home in England. (This is a pretty distant footnote, but the name Wychwood comes from “huiccewudu”, a name derived from the kingdom of Hwicce, an early Medieval Anglo-Saxon Kindgom where the forest was located. Using a few degrees and a millennia or two of separation, it’s safe for me to say there’s basically a Medieval kingdom in mid-town Toronto). Soon after Matthews built his house, him and his friend Alexander Jardine bought another plot of land to the West (#5 on that map above), where Jardine built his own house, named Braemore (presumably after the region in Scotland, but that’s my own conjecture). 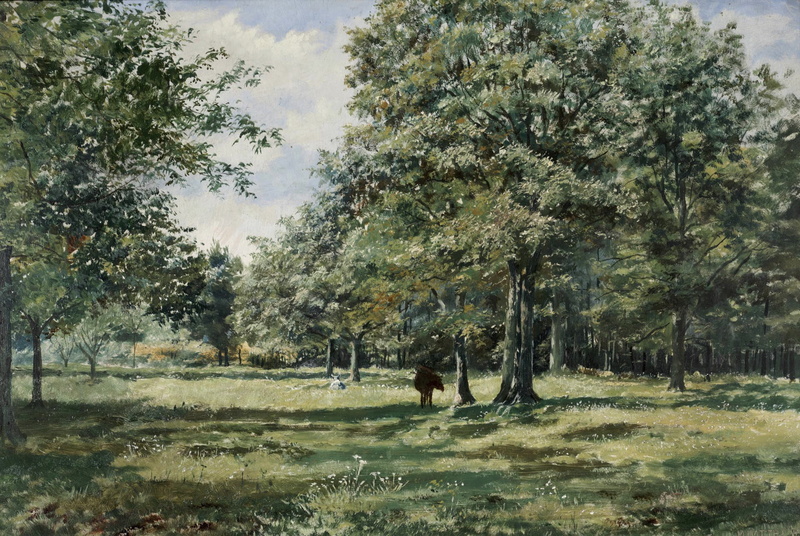 Matthews and Jardine had a vision for this newly acquired land: They wished to create a pastoral haven for artists such as themselves, with the property private and the aesthetics established and maintained at a proper standard. They soon set about dividing their property into smaller lots with the hope of attracting their friends and colleagues from the art world who were sympathetic to and excited for what Wychwood Park could become. 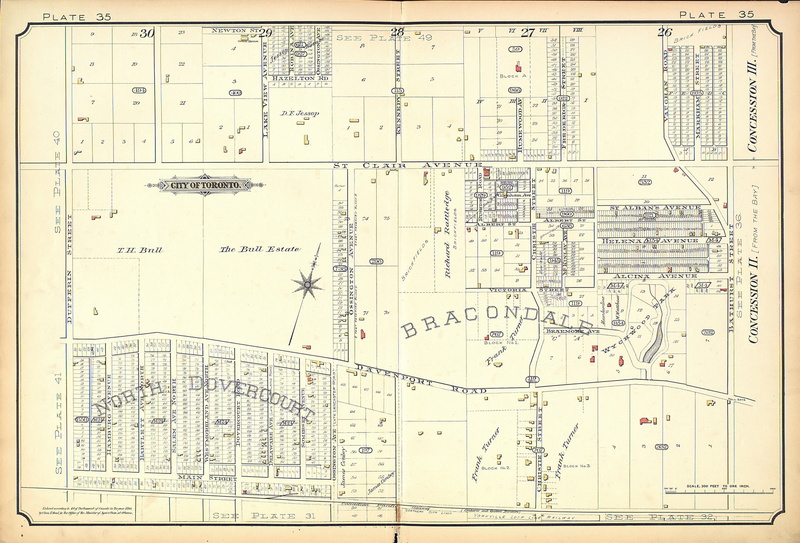 In 1891 Matthews and Jardine proposed the subdivision to the city, with 38 properties split up throughout their land. In their trust deed they also stipulated a number of land use rules, ranging from how much each house should cost (at least $3000, which is about $80,000 current dollars), to claiming the right to shut out the public to their streets, to setting a minimum frontage for each house, to the materials that houses should be built with. This was actually even before Toronto had zoning by-laws in place. They started attracting new residents by 1905, and over the following decade or so they had sold most of those initial 38 properties to artists who were friends of Matthews and his other friend George A. Reid, who was apparently a well-known and influential artist at the time. Most of the early houses were designed by an architect named Eden Smith, who also designed and built his own house in Wychwood Park. 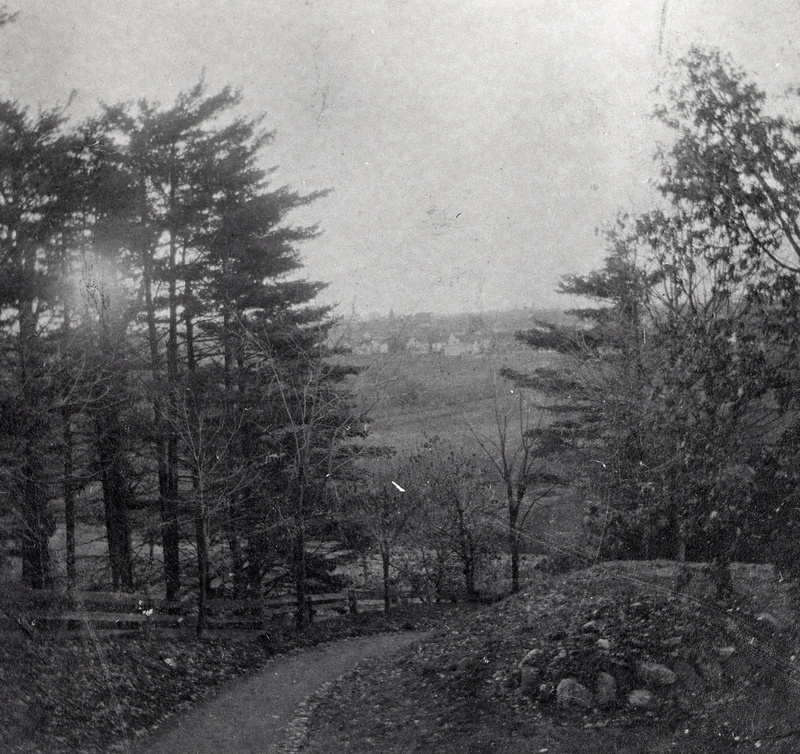 The vision for the aesthetic of the community was to have “a landscape with houses in it,” with houses that were “intimately related to their landscape settings, blending in.” Taddle Creek ran through the property and was eventually dammed up to create a pond at the centre of the community. Marmaduke Matthews passed away in 1913, and a group of trustees living in the park took over its organization. More houses were built throughout the 20s, and a few more in the 50s to bring the number up to around 60. The restrictions on materials and frontage and cost were different at that point, so those more modern houses weren’t necessarily in keeping with the rest of the building styles, a trend that has continued into our current day. 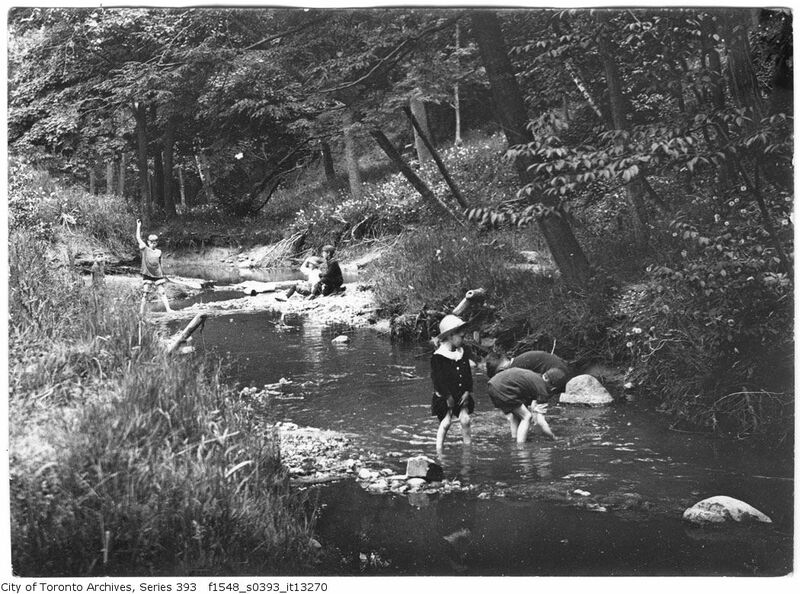 Kids playing in the creek in Wychwood park in 1916 – they look like artists to me! Many of these houses passed down through families for a few generations, but almost all the houses are now owned by a wider variety of Toronto elite, with less interest in the original hope that Matthews had for Wychwood Park, and more interest in the natural beauty, the uniqueness of the neighborhood and its properties, and the ingrained exclusivity the Park provides. Some of the original houses have been torn down in order to make room for places like this or this, but the feeling in the place remains. That’s not to say its always been a picturesque place to live, there have been some odd occurrences in Wychwood Park’s more recent history (see this story from the National Post and this one from the Star). But in 1985 the area was designated, both municipally and provincially, as a Heritage Conservation District under the Ontario Heritage Act of 1975, becoming the first such district in Toronto. Over its 120+ years of existence, some of the other famous residents have included Charles Currely, the first director of the ROM, and Marshall McLuhan. While they may have been more historically influential and had access to one of Toronto’s more beautiful residential enclaves, unfortunately none of them will ever rival Marmaduke Matthews on my list of Torontonians with the best names ever. Nice work, Marmaduke.